It is ‘unlikely’ South African Richard Levi will be in the Northamptonshire side to face Derbyshire this weekend. The opening batsman took a bang on his little finger while fielding against Lancashire in the previous LV= County Championship game and, with the NatWest T20 Blast due to begin next week, it seems no chances will be taken on his fitness for the match in Derby which starts on Sunday. Head coach David Ripley explained: “He is going to have a test on his finger but it is unlikely he will play. “There is a bit of ligament damage and with the T20 around the corner - something he is a key part of - we will probably give him a bit of extra time to recover. “We have a practise match against Derbyshire next Thursday and we would expect him to play in that. “Kyle Coetzer is in the squad to cover the opener’s position and he has well and truly been banging on the door. “He’s got big runs in the second team and has played himself into the squad. There is also likely to be a change in the bowling attack following the fine performance put in by Steven Crook during his first appearance of the season in the game against Lancashire. Crook scored 91 and 102 not out with the bat while also getting through 19 overs with the ball. David Willey will return from England action to take his place in the side meaning Olly Stone seems likely to be left out. “We’re getting to the part of the season when we talked about rotating the squad,” Ripley added. 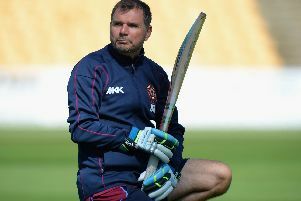 “We gave David Willey a breather in the last game so he could prepare for his England opportunity but he will come back. “Olly Stone has had some issues getting through seasons in the past and we want to get him rest when we choose rather than waiting until the really hectic part of the summer. “He bowled particularly well in the first two games and got some runs as well.